"This is a reminder of hope and possibility, of kindness and compassion, and--perhaps most salient--imagination and liberty. Through the imaginations of our childhoods, can we find our true selves liberated in adulthood?" 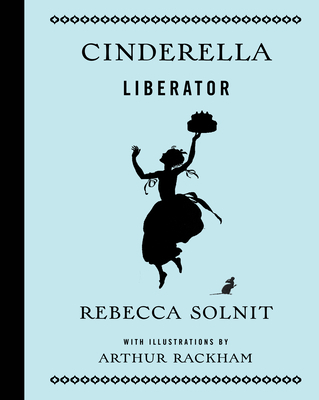 In her debut children's book, Rebecca Solnit reimagines a classic fairytale with a fresh, feminist Cinderella and new plot twists that will inspire young readers to change the world, featuring gorgeous silhouettes from Arthur Rackham on each page. Arthur Rackham (1867-1939) was a prominent British illustrator of many classic children's books from The Fairy Tales of the Brothers Grimm to Sleeping Beauty. His watercolor silhouettes were featured in the original edition of Cinderella. Writer, historian, and activist Rebecca Solnit is the author of more than twenty books on feminism, western and indigenous history, popular power, social change and insurrection, wandering and walking, hope and disaster, including the books Men Explain Things to Me, Call Them By Their True Names, Hope in the Dark, and The Mother of All Questions all with Haymarket Books; a trilogy of atlases of American cities; The Faraway Nearby; A Paradise Built in Hell: The Extraordinary Communities that Arise in Disaster; A Field Guide to Getting Lost; Wanderlust: A History of Walking; and River of Shadows, Eadweard Muybridge and the Technological Wild West. She has received numerous awards and accolades, including a Guggenheim, the National Book Critics Circle Award in criticism, and the Lannan Literary Award for nonfiction. She was a finalist in 2017 for the PEN America Art of the Essay award for The Mother of All Questions that was also listed as one of The San Francisco Chronicle's best books of the year. A product of the California public education system from kindergarten to graduate school, she is a columnist at Harper's and a regular contributor to The Guardian.